Just when we thought we had a handle on everything going on at the World Trade Center site, The New York Times uncovers a secret plan to build an elevated park above Liberty Street. 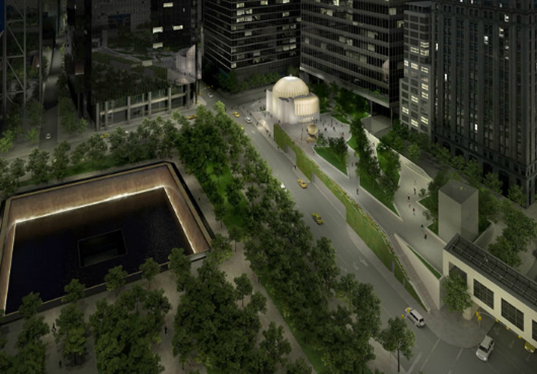 The hovering parkland will be slightly larger than an acre and it will give visitors a panoramic view of the National 9/11 Memorial and historic site when they open to the public (possibly by 2015). The project is called Liberty Park and it will provide pedestrians with an east-west passage between the Financial District and Battery Park City. There will also be a landscaped courtyard in front of the new St. Nicholas Greek Orthodox Church to provide a gathering space for up to 750 people. The project has been kept under wraps because the Port Authority of New York and New Jersey were still hashing out the final details. 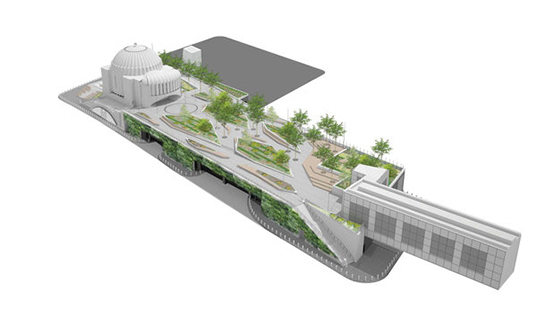 However, the first renderings of the new Liberty Park and St. Nicholas Church have already appeared on architect Santiago Calatrava’s website. Soon after the renderings leaked, the Port Authority elaborated on the park and even named its principal designer as Joseph E. Brown, a landscape architect who is the chief innovation officer at AECOM, a Los Angeles-based architectural and engineering construction consultancy. Brown explained to the Times that the project had to be an elevated park to allow trucks and cars to pass through underneath. Meanwhile, one of the most interesting and unusual features of the green space will be a “living wall” along the Liberty Street facade. It is a vertical landscape, about 300 feet long and more than 20 feet high, made of multiple plants including periwinkle, Japanese spurge, winter creeper, sedge and Baltic ivy. There are also plans to plant nearly 40 trees and shrubs with varieties such as honey locust, stellar pink dogwood, apple serviceberry, Arnold promise and pallida.